This entry was posted in Board games, Game design, Games and tagged board game design, Board Game Geek, Brett Gilbert, card game design, Empire Engine, Essen, Essen Spiel, finished card game design, Matt Dunstan, print and play, Seb Antoniou, Stephen Buonocore by Chris Marling. Bookmark the permalink. Great post. Who is the publisher. I wonder if you’re allowed to name names in your rulebook of high profile reviewers who aren’t allowed to play your game. I envision a generic “Don’t even bother, Tom” sticker that can be put on theme-light euros. Anyway, way to go for getting a publisher. You completely deserve it. Empire Engine has beat Carcassone as the first game I play with new players, and Lost Cities for the first game my wife suggests we play when we’re gaming alone. The best thing about Tom Vasel is that he’s consistent; if you watch a few of his reviews you soon get to know his biases and can judge accordingly. 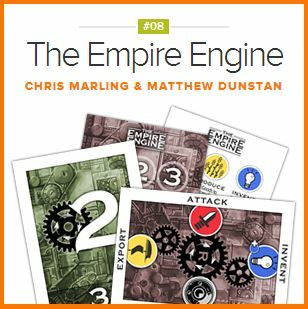 If he does ever play Empire Engine I’m sure the ‘theme’ will be an immediate minus point for him, but hopefully he’ll find something in it to like! Ever since he slated Vasco De Gama in a rather ungentlemanly way, one of my favourite games, I realised that me and Tom were born poles apart in the gaming world.